Looks incredible in a patio pot or sunny border! Has beautiful, bright, two-tone flowers. Flowers from early summer to the first frosts in October, in a wonderful 5 month display. It is winter hardy and will die back underground in the autumn only to burst into life again each spring. Supplied as a set of 3 x 9cm potted plants. This unusual, hardy perennial will look incredible in a patio pot or sunny border! 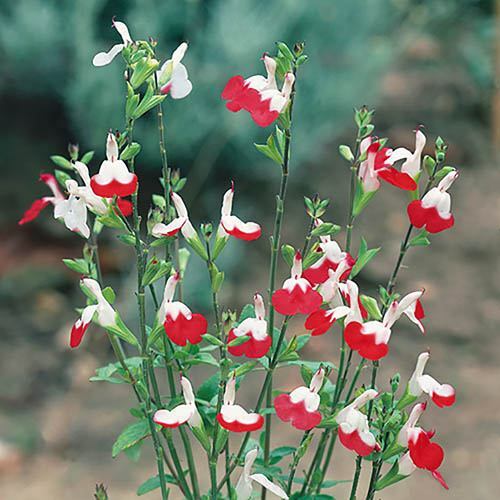 The bright, two-tone flowers with light up your garden in scarlet and white, from early summer to the first frosts in October, in a wonderful 5 month display. It is winter hardy and will die back underground in the autumn only to burst into life again each spring. In cooler summers, you will get whiter flowers, and in hot ones you will get lots of red! This Salvia is really easy to care for and flowers prolifically with minimal care perfect for beginners! Supplied as a set of 3 potted plants in 9cm nursery pots ready to be planted out.